Published: Feb. 4, 2019 at 02:41 a.m. Updated: Feb. 4, 2019 at 02:46 a.m. The New England Patriots defeated the Los Angeles Rams 13-3 in Super Bowl LIII. Check out the top 10 photos, and honorable mentions, from the game at Mercedes-Benz Stadium in Atlanta. 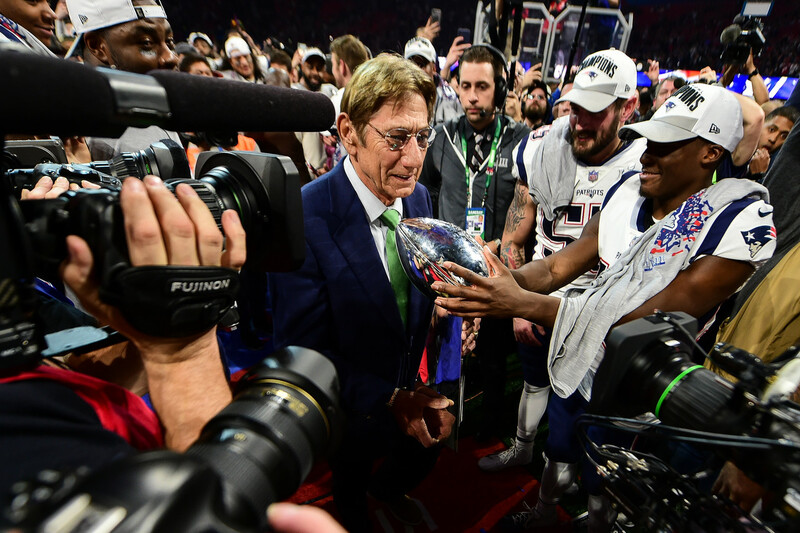 Pro Football Hall of Famer Joe Namath walks the Lombardi Trophy to the podium. Super Bowl LIII Most Valuable Player Julian Edelman stands on the podium as confetti falls. New England Patriots linebacker Brandon King celebrates in the Patriots locker room with a boom box. New England Patriots cornerback Stephon Gilmore (24) pokes the ball free from Los Angeles Rams running back C.J. Anderson (35). New England Patriots players make confetti-angels on the field following their win over the Los Angeles Rams. New England Patriots tight end Rob Gronkowski (87) makes a catch over Los Angeles Rams outside linebacker Samson Ebukam (50). New England Patriots quarterback Tom Brady is interviewed on the podium by CBS announcer Jim Nantz. Adam Levine of Maroon 5 performs on stage. New England Patriots quarterback Tom Brady celebrates his sixth Super Bowl win with his daughter. Rapper Travis Scott performs as pyrotechnics erupt around him. Los Angeles Rams head coach Sean McVay embraces New England Patriots head coach Bill Belichick after the game.